There are so many different video formats around, a free video converter is an essential piece of software for any PC. The best video converters are simple to use, and can handle a huge array of different file types. There are many reasons why you might want to convert a file to a different format. You might want to play a particular video on a device that has limited storage and there need to reduce the size of the file. You might want to keep your entire video collection in the same format, but have a few rogue entries messing up your system. Or you might want to change a video recorded in a strange format on your phone into something that is more easily shared with others. If you’re converting videos from YouTube, bear in mind that downloading videos is against its terms of service. It’s also potentially a copyright infringement unless you have permission from the copyright holder, or the video is in the public domain. With that in mind, here’s our pick of the best free video converters. When it comes to the number of supported file formats, Any Video Converter Free certainly doesn’t disappoint. It handles online as well as offline files, meaning that if you like the look of some videos on YouTube, you can quickly and easily convert them into a format suitable for offline viewing on your mobile without worrying about your data allowance. More than just YouTube, you can also download and convert videos from Facebook, Vimeo, Metacafe and more, and Any Video Converter Free also features the option to rip audio from CDS and DVDs. You’ll find support for all of the video formats you can shake a stick at, including ready made profiles for different devices, and editing options such as trimming, cropping and rotating allow for basic cleanup tasks. If you want to get creative, you can experiment with video effects to achieve a unique look as well. If you need more options, Developer Anvsoft also offers a premium video converter, Any Video Converter Ultimate, which can remove DRM protection, convert videos in batches and burn videos to disc. Freemake has built up something of a name for itself for producing powerful yet easy to use software, and making it available free of charge. Freemake Video Converter is no exception, continuing the company’s enviable track record. The free video converter can not only convert files from your hard drive to almost any format, it can also be used to download and convert online videos from the likes of YouTube. With simple editing tools to trim unwanted footage, the ability to add subtitles, and convert to and from DVD, Freemake Video Converter has all of your everyday conversion needs covered – and more. When you first install Freemake Video Converter, some features (including converting YouTube videos) will be locked. After three days you’ll receive a free Web Pack as a gift, which will lift this restriction. Look out for a notification in the System Tray telling you when the Web Pack is available. Free HD Video Converter Factory prides itself on being so easy to use that its website features a 10-second guide to getting started. This might seem like an exaggeration, but it’s actually true. You can drag and drop a video onto the program interface, or use the selection menu, select the format or destination device and hit the Run button. That really is all there is to it. You’ll be pleased to know that the software’s convenience doesn’t come at the expense of features. While you can start the conversion process in a matter of seconds, you may wish to spend a little more time customizing the output. Cutting, cropping and impressive special effects are all on hand to give your videos the look you want, and the way destination formats are presented is highly intuitive. Beginners can select a profile tailored to a specific playback device, while more advanced users can make a manual selection and customize things further. 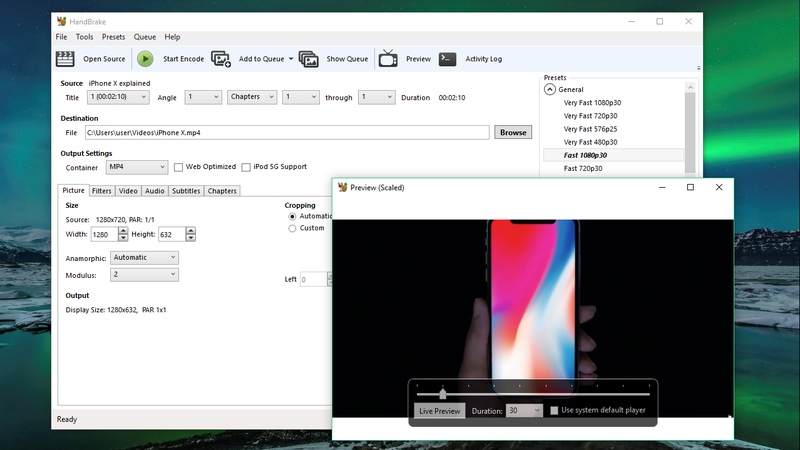 HandBrake is a free video converter that’s well known to Mac users, but less famous in the world of Windows. It is worth noting that this is still something of an experimental program and it hasn’t even reached version 1.0 in its Windows incarnation, but that doesn’t mean it should be overlooked. Available for Mac, Windows and Linux, Handbrake is a great choice for anyone who works on multiple platforms, but is also great for anyone who is dedicated to Windows. A slight word of warning: the other programs featured in this roundup have very approachable interfaces, but the same cannot really be said of HandBrake. The program is powerful, but utilitarian. There are a lot of features that allow for precise control of video conversion, including cropping, advanced filtering and frame rate adjustment, as well as presets for those who just want quick results. Handbrake may take a while to get used to, but the output is worth it. Earlier this year the Mac version of HandBrake was compromised with malware, but the software is now secure and safe to download. DVDVideoSoft is known for its superb free media software that performs exactly as advertised, and Free Video Converter is no exception. Its interface is clean and uncluttered, and it can convert batches of videos with ease. 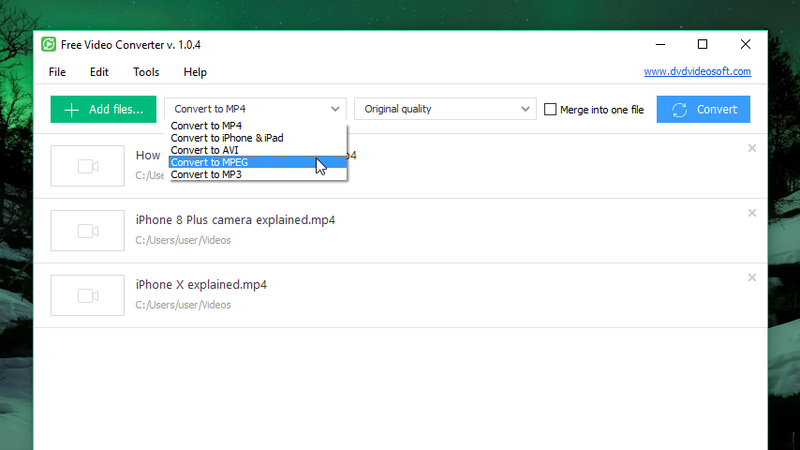 Free Video Converter has a small set of output options (MP4, AVI, MPEG and MP3 are available, plus an option optimized for iOS devices), but that might be plenty if you’re not used to working with video files, and the likes of Handbrake or MediaCoder look excessively complicated. There’s a choice of quality settings, and you can merge several clips into a single file while they’re converted. It’s a shame that videos converted with Free Video Converter are watermarked. 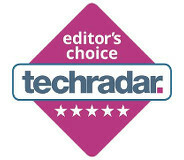 The mark isn’t terribly intrusive, but it prevents this otherwise excellent software ranking higher in this list. Check out our video below for the best free video editors.